One spring, in the meadow that is part of Thickson’s Woods Land Trust in Whitby, Ontario, many species of birds were making their homes. The proliferation of long grass, low shrubs, dense thickets, evergreen trees and the remains of an old orchard made it the perfect habitat for many different songbirds. 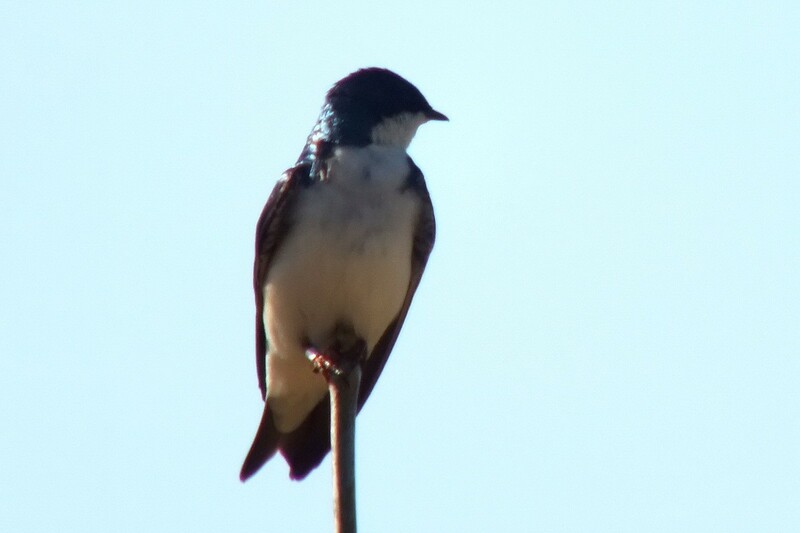 On our visit, Bob and I saw numerous Tree Swallows. 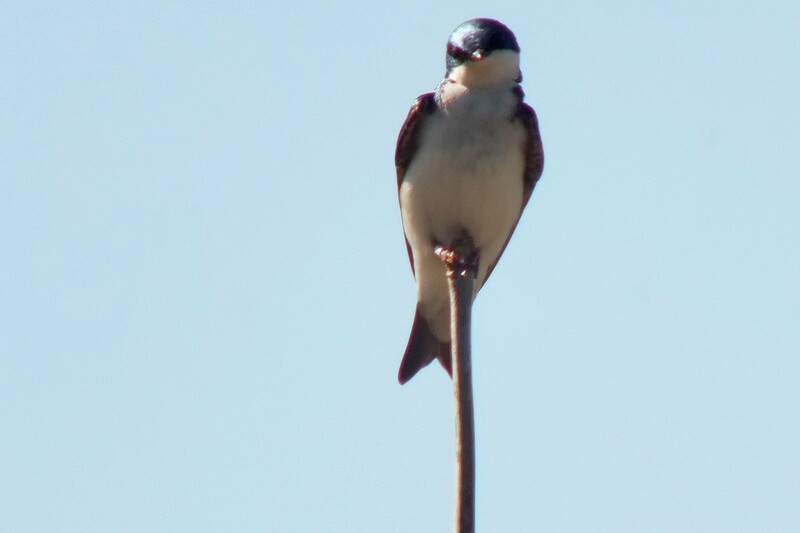 Tree Swallows are easily identifiable by their clean white breast and glossy steel blue uppers that extend down on the sides of the head well below the eyes. When the sunshine glints off their plumage, the feathers are very showy with a distinct greenish sheen. We were lucky to catch one of the birds sitting still so busy were they darting about in their quest for insects. 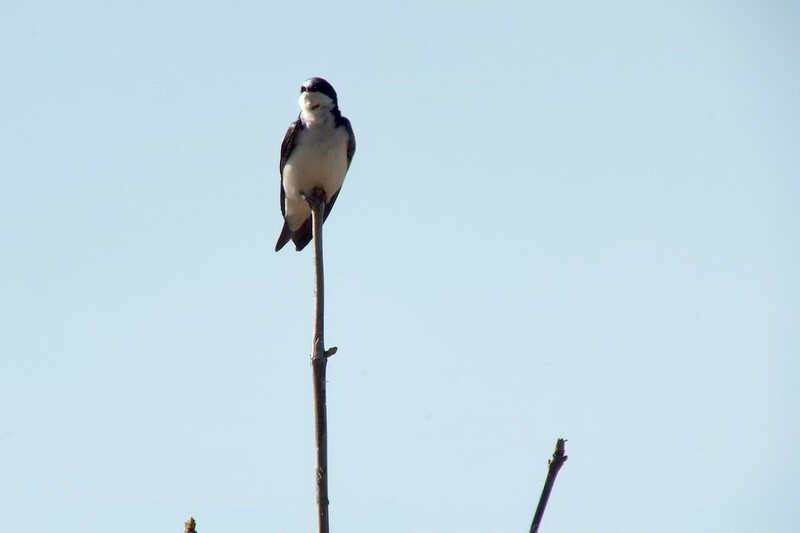 Tree Swallows are a common sight over summer fields and wetlands. Being skilled aerialists, they pursue flying insects with acrobatic twists and turns, their iridescent feathers flashing in the sunlight. Thickson’s Woods borders a significant series of ponds and wetlands, so together with the meadow, perfect conditions exist for an abundance of insects. 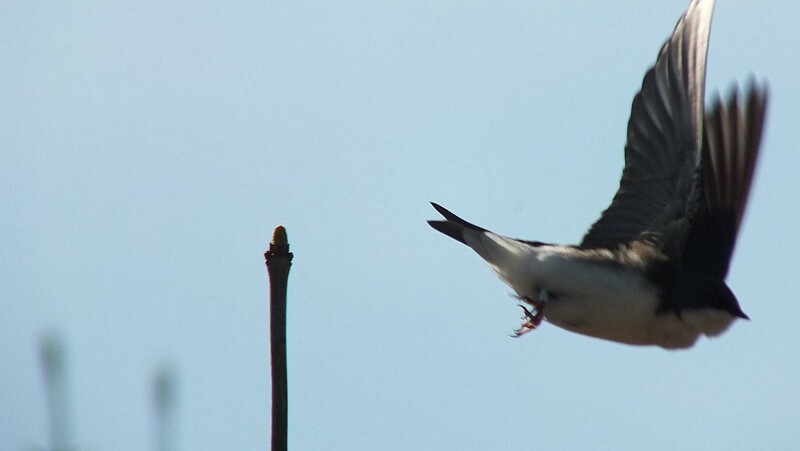 but instead, the Tree Swallow made a beeline for the nest box that was erected nearby. 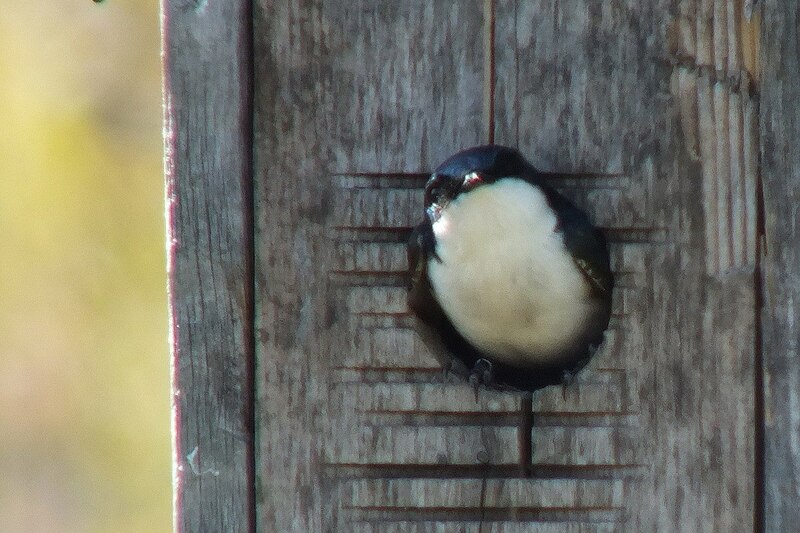 Its mate was peeking out from the bird house, and it appeared to be the one focused on an insect that was flying by. 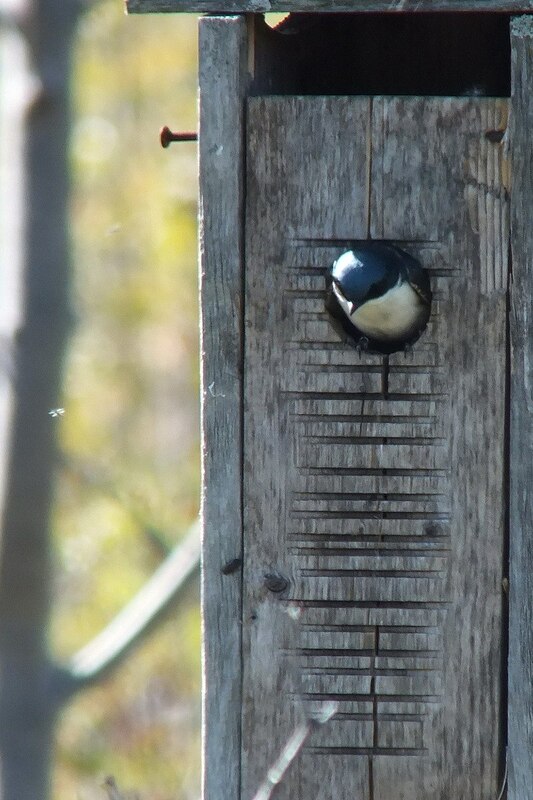 Tree Swallows usually nest in tree cavities where their nest consists of multiple layers of grasses and thin twigs, but they are more than willing to use nest boxes provided by helpful humans. The swallows line the nest with large feathers from other species of birds. 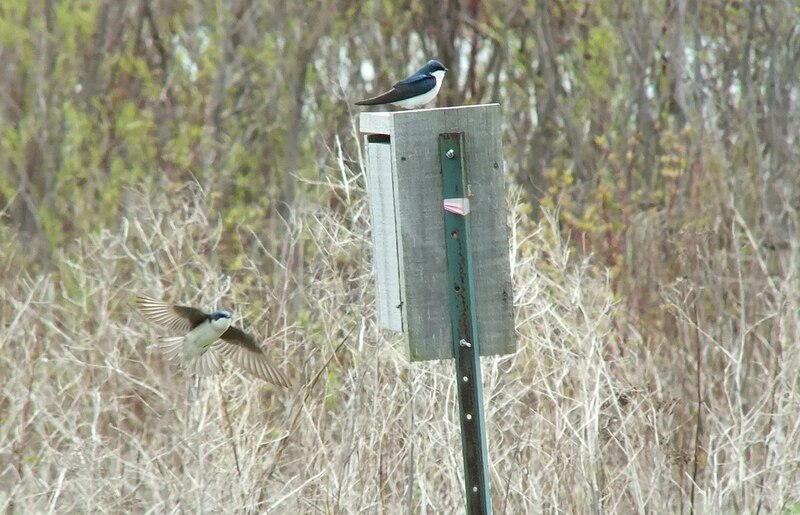 In this photo, taken at Tommy Thompson Park in Toronto , Ontario, we see another pair of Tree Swallows staking a claim on their chosen nest box. We visited Tommy Thompson Park on Mother’s Day, and it was quite the atypical day. 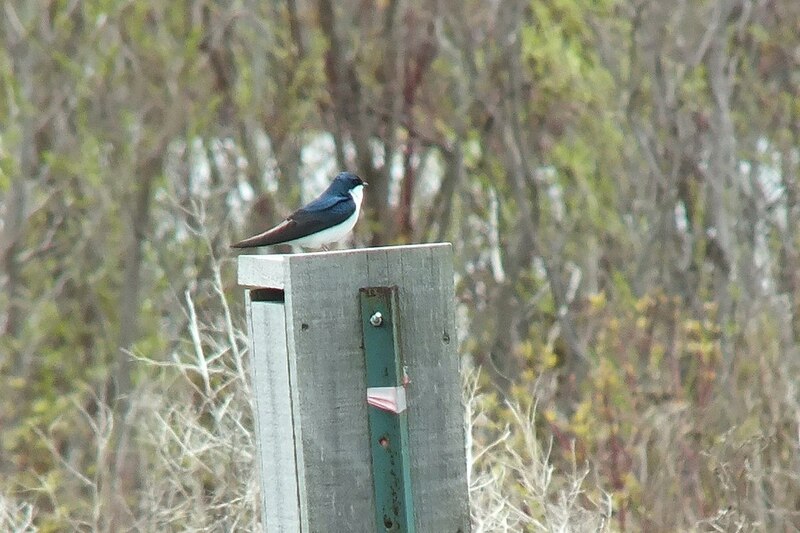 By times, rain mixed with ice pellets and sleet pelted us as we walked along the Leslie Street Spit, but still the Tree Swallows were actively chasing the plentiful insects that were suspended in the air. 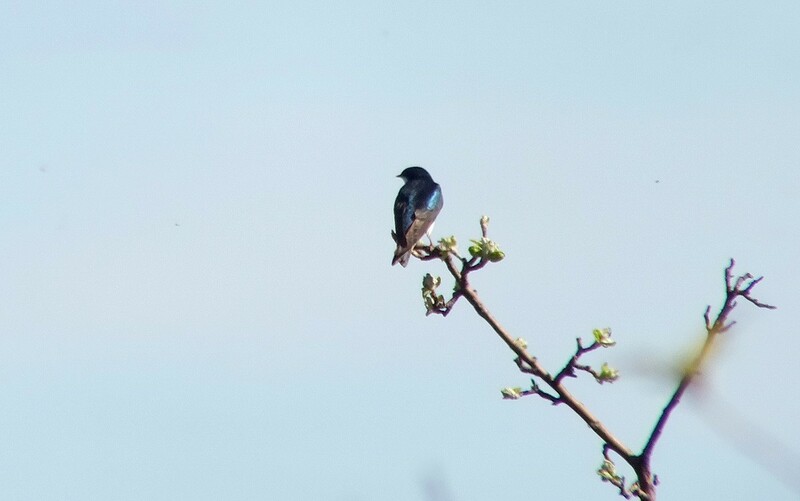 Our parting shot at Thickson’s Woods was of a gleaming blue Tree Swallow balanced on the end of a flimsy apple tree branch. How beautiful that will be in another few days when the blossoms erupt into full flower. Let’s hope that the warmer temperatures return soon.